Designed to store up to four diapers, one wipe case and a changing pad, the pouch makes diapering easy and simple. 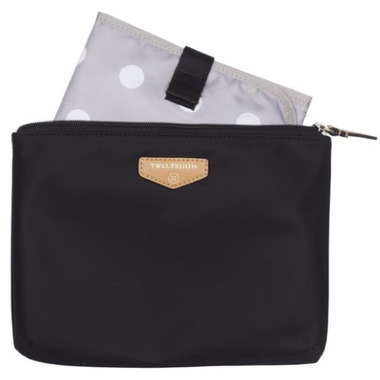 Even after the diapering stage, it is the perfect pouch to store make up, extra clothes, snacks and more. Simply zip it, toss it in your bag and off you go. Water resistant coated soft nylon with vegan leather trim. Polka dot logo interior lining is coated with PVC-free water-resistant coating. Interior has a zipper pocket. Comes with matching polka dot logo lining nylon changing pad. Machine washable.